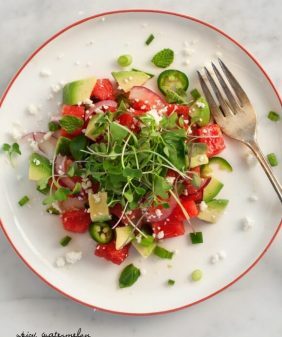 A refreshing summer tomato salad with watermelon, avocado, jalapeño, tossed in a tangy ginger-lime tamari dressing. Vegan and Gluten Free. I hope you have lots of tomatoes. Why? 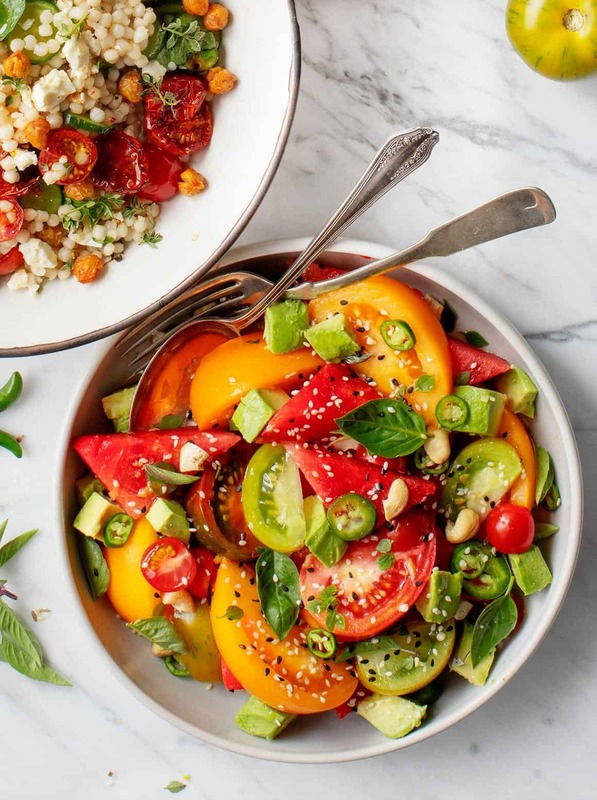 Because I have another really great tomato salad for you! This one is completely different from Tuesday’s salad – it’s really quick and full of spicy/sweet/savory/tangy flavor. 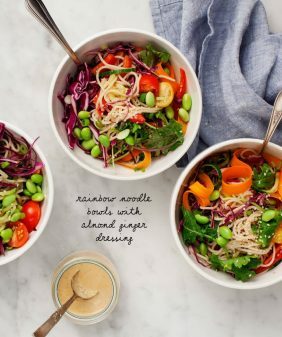 You may recognize the gingery tamari-lime dressing from the cookbook and also from these rice bowls. It’s so perfect here because the contrasting flavors really make the sweetness of the watermelon pop. This is the salad that I’ll be eating until summer is over because it’s just so delicious and refreshing. 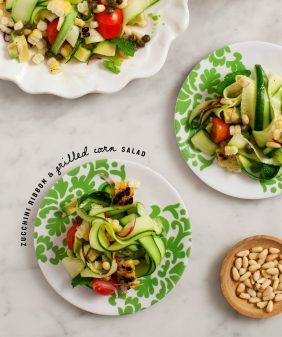 I love to serve this salad as a side dish with whatever I’m grilling! Make the dressing: In a small bowl, combine the tamari, lime juice, vinegar, garlic, and ginger. 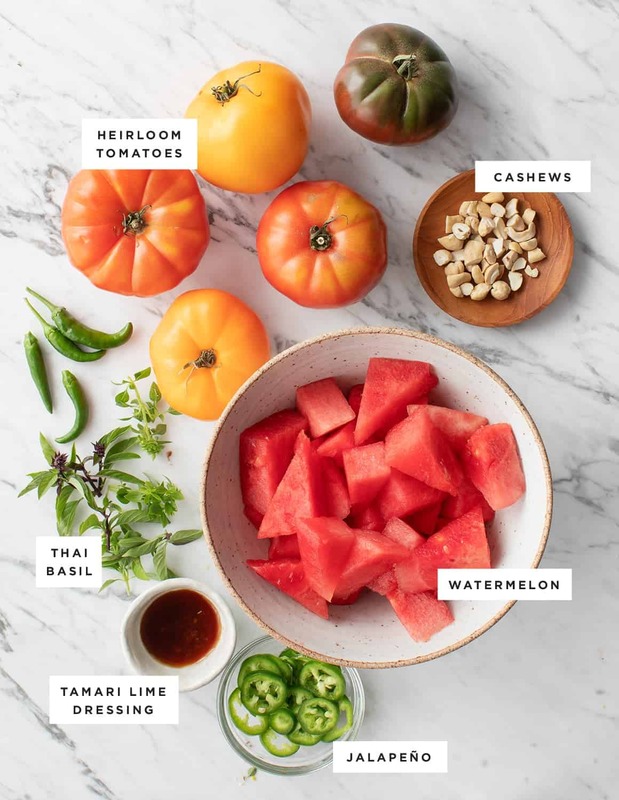 Arrange the tomatoes, watermelon, and jalapeños on a platter or in a shallow bowl. (This salad should not be served in a deep bowl because the flavorful juices will sink to the bottom.) 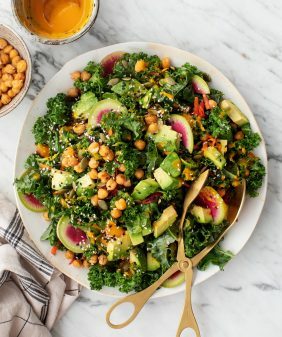 Drizzle with the dressing and top with the basil, cashews, and avocado. 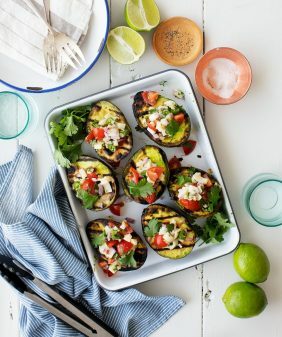 Season to taste and serve with lime wedges. I swear I’m not a serial commenter but damn, girl your recipes are amAZZZzzzing! My husband works at a local private school that has a very large garden and he’s been bringing home heirloom tomatoes by the bucketload. Pairing them with watermelon and jalapeño (!!!) and combining it with that salty/sweet/sour dressing is brilliant. Excellent, easy, healthy and very colorful dish. And now I maybe using raw jalapeños in my salads a little more often–there is something about that lingering spice that takes it to the next level. Ha ha, you can become a serial commenter, I would love that :). I’m so glad you loved this one!! This sounds like a summer BBQ must-have! Awww…this is exactly what I’m craving right now. I have tons of heirlooms from the farmers market waiting for this! Tried this last night! Incredible! Used regular tomatoes from my garden and no avocado because they were $2.49 each!! Will be making this for company. Thank you for such a lovely dish. I’m intrigued to try tomatoes and watermelon together!! I’ve never thought of that. Ok but what a genius idea! Anyway you can add watermelon to anything is a win in my book. And those photos, like wow. I’m in love. Thanks for the inspo. What a pretty plate! Yum! This recipe seems to be so unique and mouth-watering. 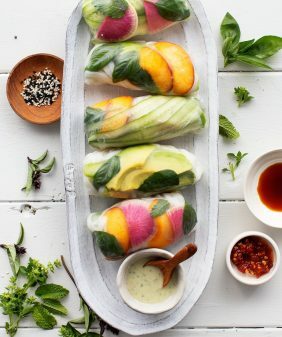 I always keep hunting for healthy yet tasty recipes, thanks for sharing interesting flavors of recipes. Definitely going to try this.